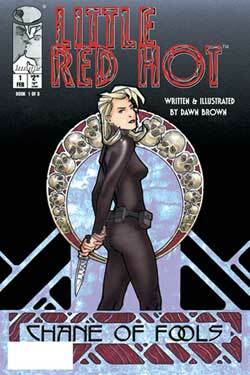 I met Dawn Brown shortly after her first Little Red Hot miniseries was released by Image. I was immediately impressed not only by her work, but also her winning attitude and her approach to comics. Even better, everything she's done since that first meeting has reinforced my incipient admiration for her and her work. She's always struck me as a creator who wasn't afraid of telling smart, fun and highly personal, even idiosyncratic stories that follow the dictates of her heart and muse rather than tracking whatever "hot" trends might be currently in vogue. So when she announced that her next book would be a graphic novel using the legendary work of Edgar Allen Poe as its major inspiration, I was more than a little intrigued. 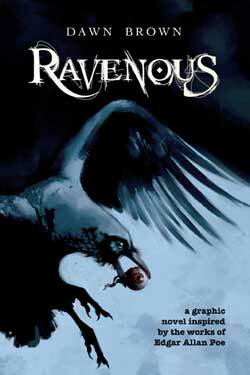 The results of this little experiment, an original graphic novel that resounds with deeply satisfying echoes of the past master's work called Ravenous, was released last year under an imprint which very quickly disappeared, taking Dawn's compelling work with it. Bill Baker: Before we talk about your work on Ravenous, I wanted to ask you about something I noticed in your biography. Specifically, you mention that meeting Bob Kane in 1996 was the reason you began to make comics. So, what was it about the man and that particular experience prompted you to pursue a side career in comics? Dawn Brown: I was working on the film Batman & Robin at Warner Bros. at the time. As a lifelong Batman fan, I was thrilled to be there, working in the Batcave, Wayne Manor, seeing the Batmobile, etc. But the script for that film was so bloody awful, it was heartbreaking. I knew I could come up with something better than that story. I just knew it. So I began tinkering around with some story ideas on the side. Bob Kane paid a visit to Warner Bros., and the prop master arranged for me to spend a few moments with him. He was very gracious and generous. He seemed sincerely awed by the spectacle of the sets. I asked him about what if felt like to have created something that started out as something so simple, that has grown into something so huge. As an artist or a writer, I guess you never really know how much or in what way your creation might affect others. Batman is embraced by generations of people, all around the world. Whether it's some little kid tying a towel around his neck and running around the back yard like a superhero, or a boy scout fashions his pinewood derby car to look like the Batmobile, or a young artist puts pencil to paper to imagine her own Gotham City, I found this truly inspiring. So I committed myself to telling my own stories, and comics were the way they would be told. BB: What about the medium of comics caught your interest back then, and what about the art form has kept you coming back to it for ten years? DB: I've always believed comics/graphic novels are one of the best platforms for storytelling. You can have visuals and pacing like a film, yet have the intimacy with your audience that only comes from a book. Producing a comic is far more cost effective that producing a film, for the price of a trip to Kinko's, you could publish your own book! From a creative perspective, this medium gives you 100% control of your actors, special effects, editing, dialogue, etc. I work in the film industry for my day job. I am a very small cog in a giant machine, there are so many people involved with making a movie, I think sometimes the storytelling gets lost. With comics, I really get to decide exactly how the story unfolds, I find that immensely appealing! BB: Ravenous was originally released by the now moribund publisher Speakeasy last May , and it's just be resolicited under your own imprint, Rumble City Graphics. Sounds like it's gone through a long, strange trip indeed. What was that experience like, what lessons might you have learned from it? DB: Very true. It was an incredibly frustrating experience. I put my heart into that book, and then I put the book in the hands of the publisher. I believe the manner in which Speakeasy handled business effectively "killed" the book and squandered whatever opportunity it had to reach wide distribution. Yes, the remaining books were returned to me, and I can sell them myself, but I'm very aware the "moment" for this book has passed. As for lessons learned, I will never again put myself in any "back-end" deals, as several creator-owned publishers offer. I've been burned too many times by giving away my work to publishers for free and not seeing any return. BB: So, how did your love of comics collide with your obvious admiration for the work of Edgar Allen Poe? When did you first come up with the concept for Ravenous, how did you develop that idea into its present form, and how did it change and grow during that process? DB: A few years ago, I was researching classic literature for ideas for the next Little Red Hot, and came across Poe. I noticed a lot of his stories were very similar, he would simply change the characters and situations. For example, "The Black Cat" is very similar to "The Tell-Tale Heart". I thought it might be interesting to strip these stories down to their basic framework and lay my own stories on this framework. I abandoned the idea of making this a Little Red Hot project, and Ravenous came into it's own. BB: Now, you've stated in your introduction and in prior interviews that Poe is the major influence upon Ravenous. Which lead me to wonder who might be some of the different people--artists, musicians, directors, family, etc.--who have had a direct and lasting influence on Dawn Brown's work and life? DB: Every movie I work on, I make a point of observing the director's approach to telling the story. Given the script, what the director chooses to share with the audience is as important as what he chooses not to share. A few of my favorite film makers I have had the pleasure of working with include Tim Burton, Clive Barker, The Coen Bros., David Fincher. As far as comics go, my all-time favorite influences are Frank Miller and Bill Sienkiewicz. Those guys really broke the mould. BB: You know, when I look at Ravenous, I see the Dawn Brown I know from Little Red Hot and Vampirella, but also there seems to be some new, perhaps digital-enhanced, elements in there now. Which makes me wonder how your art and approach to creating it might have changed over the years? DB: The process has definitely streamlined over the years. I started out on Little Red Hot using photo reference from books and magazines, but that look too long. Then on Vampirella, I hired a model for the poses, but that was too expensive. For Ravenous, I used several artist's reference figures and posed them however I wanted in scale models I built for the environments. This system seems to work the best for me. I still draw all the line work by hand, but now all the painting is digital. BB: Well, what's your method of creating your comics? Do you start with an outline or script and then hit the boards, or do you tend to go right to thumbnailing and discovering the specifics of the story and plot as you create them? DB: I usually write the script longhand on legal tablets, then thumbnails. I usually keep hopping back and forth between the script and the art all the way through! BB: You mentioned Vampirella earlier, I was wondering why you chose that particular project, and what working on that character and title was for you? Did it allow you to explore some new facets of your work, or was it more of an enjoyable side trip for you? 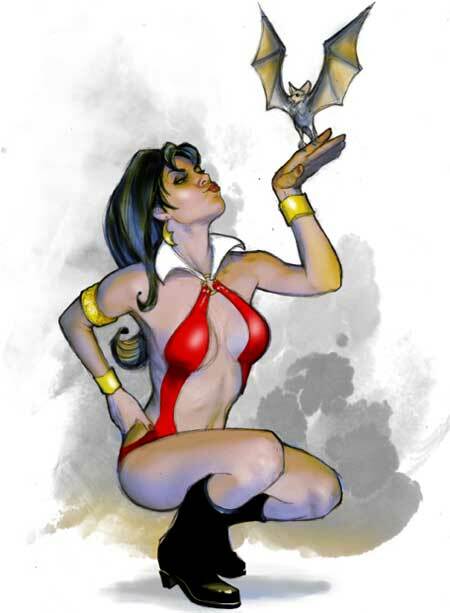 DB: Vampirella was my one and only "work for hire" experience. I loved working with Maureen McTigue and everyone at Harris. It was a great experience to step into the shoes of a famous character and put my own spin on her. BB: Do you have any interest in any company-owned characters or titles out there--and what about those particular characters intrigues and interests you? DB: Yes, I've always wanted to work for DC or Marvel on the iconic characters. Batman, Superman, Spider-Man, Daredevil, Elektra, etc. were integral to my formative years, and I would relish the opportunity to give something back to these books. Obviously, I do not know how to make that happen. BB: You work as a set designer by day for the film industry. How might that have feed into your love of comics generally, and of making them? DB: I've been fortunate to work on several "comic book" type movies, I really enjoy working on those types of projects, typically, the sets are more fantastical and interesting. And they usually serve to reveal something more about the characters. Obviously it would be more interesting to work on sets for Spider-man 4 as opposed to Legally Blonde 4. BB: What do you get, aside from a paycheck, from that kind of design work? What does that kind of self expression feed, if anything, and how might the satisfaction you get from this work differ from whatever happiness you get from comics? DB: Well, the paycheck, pension, and health benefits are the main things. Any day I get paid to draw is a good day. It doesn't matter much to me if it's movie architecture or not. There isn't really the chance to express myself, I'm basically there to facilitate someone else's vision. The satisfaction I get from set design is simply from a job done to the best of my abilities. BB: And what do you get from making comics? DB: The satisfaction of expressing my own ideas, and connecting with readers, one by one, all over the world. It's priceless. I suppose it's the one reason I keep on going with comics. BB: What do you hope the reader gets from your work? DB: I suppose I hope they simply enjoy it! 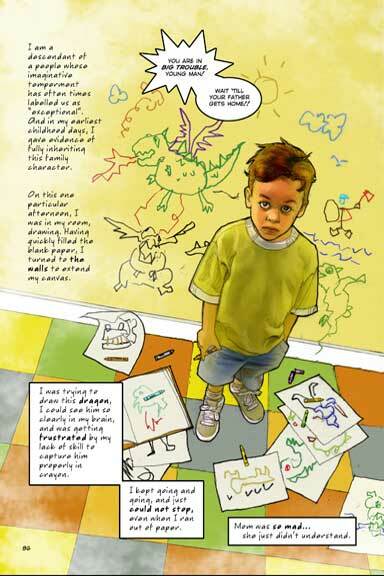 Any book from Dawn Brown is a labor of love, each panel has been drawn with purpose and intention. I hope that comes through. BB: What does the future hold for Dawn Brown? What about Rumble City Graphics? DB: Man, I don't know. I was recently promoting Ravenous for the re-release this September, and the one thing retailers requested was more Little Red Hot! I would love to keep going, but my personal projects are on hold for financial reasons. The Speakeasy fiasco really left me in a pinch and I am presently unable to fund any more of my own projects. My next move in comics is in the hands of those editors and publishers out there that have that special project I would be perfect for. I hope we find each other. And thanks a million, Bill! For more information on the work of Bill Baker, visit www.BloodintheGutters.com, his personal home on the web. Also, Bill's second book, lan Moore's Exit Interview, which features a brand-new 3-plus hour interview with the master storyteller exploring his experiences and ideas concerning the business side of comics, is offered on page 219 of this month's Previews. Finally, a brand new short-short tale by Bill is included in Wicked West II, which is also currently available for preorder on page 143 of this month's Previews catalogue. This thick anthology also features work by the likes of Mike Oeming, Mike Baron, Tommy Castillo, Mark Ricketts, Mike Hawthorne, David Michael Beck and J. K. Snyder, among others, along with new stories of the supernatural frontier by series creators Todd Livingston, Bob Tinnell and Neil Vokes.